UNITED NATIONS, September 15 -- On Darfur, less than two weeks after the UN delayed two days in going to the Tabarat Market where over 50 people were killed, the issue seems to have been dropped by the UN Security Council and its most prominent members. On September 15 the Council has scheduled consultation “on Sudan,” and will receive a closed door briefing from top UN Peacekeeper Alain Le Roy. Inner City Press has asked two Permanent Five representatives, and another Council member spokesman, and each has said the only Sudan topics to be considered are North - South, the Comprehensive Peace Agreement and the referendum. The implicit message to the Sudanese government, and to the UN Department of Peacekeeping Operations, is that the protection of civilians in Darfur is not that important, at least for now. 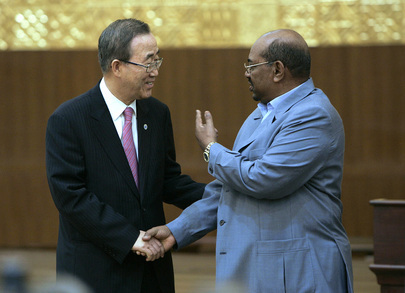 Even the Security Council's long announced trip to Sudan is in doubt. One of the lead countries told the Press on September 15 that nothing has been agreed with the Sudanese government. The Council's desire is to go to Kampala (led by Uganda), South Sudan (led by the US), Darfur (led by the UK) and then Khartoum (jointly led by the US and UK). But there has been no agreement that president Bashir would meet with the Council. Therefore the trip, projected for as early as the first week of October, is in jeopardy. While the US had made much of President Obama's plan to attend a UN “high level” meeting on Sudan on September 24, Inner City Press is told that only a weak consensus statement is expect from the meeting, which will include Khartoum-based vice president Taha as well as Salva Kiir from South Sudan. Likewise only a weak Presidential Statement encouraging the North - South referendum scheduled for January 9, 2011, is expected after the September 15 consultations. This is the first of the Council's monthly meetings on the referendum, and Darfur is not slated to be mentioned, much less discussed. Inner City Press asked, or tried to ask, US Permanent Representative Susan Rice if Darfur would be discussed at Wednesday's consultations as a US Mission to the UN media reception held on Tuesday night. Ambassador Rice first said that both South Sudan and Darfur would be discussed, then said only North - South and walked past. Asked later about Sudanese restrictions on UNAMID's movement in Darfur she said nothing. Another attendee told Inner City Press that perhaps the lack of response by the peacekeepers is due to restrictions imposed by the country that contributed them, and not by the UN. 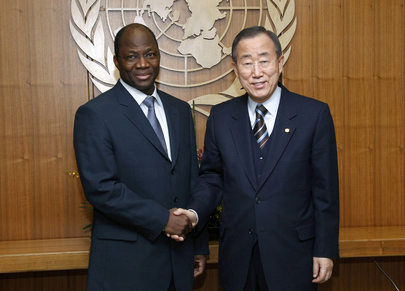 But how then can UNAMID -- or MONUSCO in the Congo -- be said to protect civilians? Watch this site. 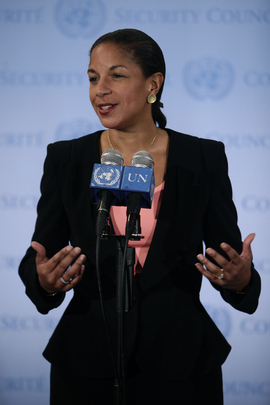 Footnote: Ambassador Rice was asked, by a journalistic fellow at the UN, is she is related to Condoleezza Rice. She said no, to her credit gently, and joked about height with other correspondents. CNN was allowed to film outside and inside the reception; hence this report on what Inner City Press told them should be called “Rice on Ice.” To be continued.